I'm from Toronto, Ontario, Canada, and lived in Ottawa, Ontario, Canada from 1997 - 2003; I moved back to Toronto in October 2003. Ottawa is a beautiful place to live, however there is something about the megacity-ness of TO, especially for an urbanite like me :) We do not have very much family in Canada, but those who are here are very important people in my life, as well as those everywhere else! I'm a Canadian of Greek descent. I've heard almost every "My Big Fat Greek Wedding" joke/comment/question there is out there. For the record, I think it's a great movie, and somewhat indicative of what's it's like to be a North American of Greek descent. One thing is true, Greeks are deservingly proud people, and know how to rip it up! Most Greeks in Canada ended up in Toronto, Montreal, Ottawa, Vancouver, and you'll find sprinkles of them pretty much everywhere else. In my ongoing quest to find Kralidis folk online, I discovered that I had a cousin in Zurich, surely there's more! 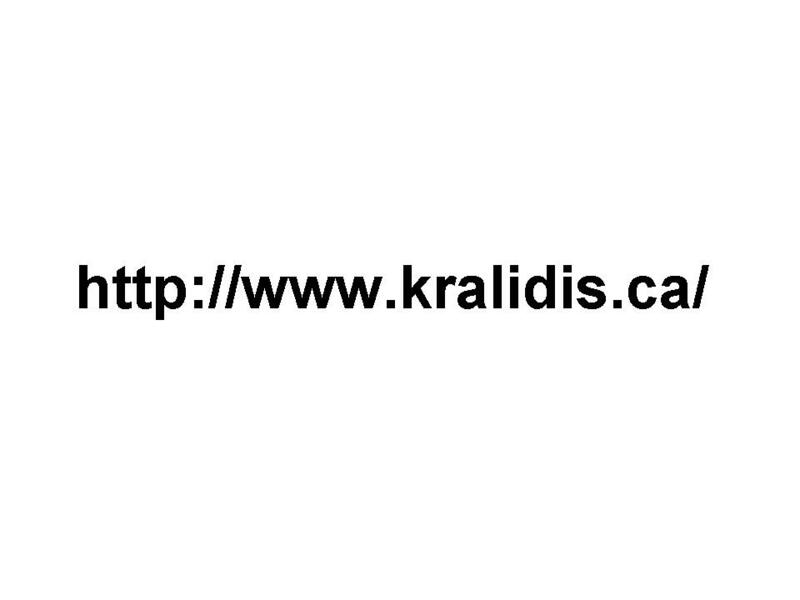 If you are or know of any other Kralidis people, I'd like to know, so contact me. Or, check out the message board online at ancestry.com. I have family in: Canada (Toronto, Vancouver), United States: New York / New Jersey / North Carolina, Switzerland, Australia and Russia (I'm pretty sure). I'm a travel junkie, basically since my first part-time job allowed me to afford it. Between business and pleasure, I get to see alot of interesting places. My pictures area has some photos from my adventures. I'm a bit of an 'off-the-beaten path' and wandering traveller. I like to wander to not particularly interesting parts of a city, basically to get a local view of things. For example, in Halifax, Nova Scotia, Canada, I never spent much time at the Citadel, but had an interesting conversation with the owner of the pita shop on Hollis about his experience as an immigrant to Canada, and living in Halifax. In general, this has resulted in many interesting, sometimes dangerous, but most of all unforgettable experiences. My Personality type is ISFJ (Percentages: E/I: 23/77, S/N: 67/33, T/F: 31/69, J/P: 71/29). Check out my strengths and weaknesses. So what do I do? I moved to Ottawa in 1997 for greener educational and career pastures. I worked for the Canada Centre for Remote Sensing, as part of Natural Resources Canada, from 1998 - 2003. There, I initially worked with images of the Earth taken by earth observation satellites. Pretty cool stuff. Then I got into "Geospatial Web Services" and Geospatial Data Infrastructure, in support and development of the Canadian Geospatial Data Infrastructure (CGDI). I'm also into standards for the stuff I do, mostly with the Open Geospatial Consortium (OGC). As my colleague Allan Doyle says, I've been bitten by the Interoperability bug. Perhaps my most proudest accomplishments while there are generation of the Ground Control DataBase, the development of a owsview, a software application to integrate distributed geospatial data and services, and being part of the OGC specification team for Web Map Context Documents. Check out my resume for more details. Natural Resources Canada is a great place to work, and people there are hard to beat. Then, in 2003, I went to Environment Canada, doing the same type of work in a enabling capacity for the department, as well as in support of the Canadian Information System for the Environment. Environment Canada was somewhat new to the geospatial interoperability game; now I'm proud to say that, as an organization, we have the most public geospatial web services in Canada! I continue my work with CGDI and OGC, only now with an 'environmental' hat :). These days, I work with our Chief Information Officer Branch, concentrating on the geospatial web; I work in Toronto, Ontario, Canada. I am slowly becoming over-educated. After barely getting out of high school, I did my undergrad at York University, concentrating on Urban and Social Geography. Until then, I never really used a computer in my life. Which resulted in underemployment. Then, I moved to Ottawa and got a GIS certification at Algonquin College. Still motivated, I decided to pursue a Masters degree at Carleton University. My research thesis dealt with Geospatial Web Services and their impact on Geospatial Data Infrastructures. I successfully defended my thesis on 07 February 2005. I'm an open source guy. I think the best software technologies are a result of an open development framework, which allows contributions from the community, as well as letting one tweak code as they wish. Alot less politics and hence alot simpler. I use open source software for all aspects of my development. This is especially true for the geospatial stuff I do. In addition to being an avid user of open source geospatial software, I like to contribute to their development. You can find me hanging out as tomkralidis on IRC. Moving back to Toronto made me realize something: Toronto real estate prices are just a bit higher than Ottawa. When I lived in Ottawa, I lived in a nice part of the west end. Prices for rent in Ottawa at the time were ludicrous, so as a result I undertook home ownership, and alot of house projects for my bungalow. It was fun to be a homeowner (most of the time), and I'm glad to say that I'm at it again with my current place. I've been fooling around with computers and the Internet since I moved to Ottawa. As it happens, I came across a CDROM archive of my old HTML work while moving, so I decided to post my first ever webpage (circa 1998), unedited, for nostalgia and a good laugh. The last few years have rekindled my childhood interest in professional wrestling. Yes, I watch WWE on Monday nights. It's fake, sometimes ridiculous, but it's also reflective of current society, and a male soap opera. So there.